Mahdavinejad, Mohammadjavad. (1395). در جستجوی معماری سرآمد: ظرفیت های معماری معاصر ایران برای تبدیل به میراثی برای آینده. معماری و شهرسازی آرمان شهر, 9(17), 129-138. Mohammadjavad Mahdavinejad. "در جستجوی معماری سرآمد: ظرفیت های معماری معاصر ایران برای تبدیل به میراثی برای آینده". معماری و شهرسازی آرمان شهر, 9, 17, 1395, 129-138. Mahdavinejad, Mohammadjavad. (1395). 'در جستجوی معماری سرآمد: ظرفیت های معماری معاصر ایران برای تبدیل به میراثی برای آینده', معماری و شهرسازی آرمان شهر, 9(17), pp. 129-138. Mahdavinejad, Mohammadjavad. در جستجوی معماری سرآمد: ظرفیت های معماری معاصر ایران برای تبدیل به میراثی برای آینده. معماری و شهرسازی آرمان شهر, 1395; 9(17): 129-138. دانشیار معماری، دانشکده هنر و معماری، دانشگاه تربیت مدرس، تهران، ایران. اساس مهمترین مشخصات و ویژگی های شناسایی شده در میان آثار منتخب و ارزشمند آثار معماری معاصر که ثبت جهانی رسید هاند طراحی شده است. این ویژگ یها عبارتند از: لول- حوزه معماری به معنای اخص کلمه: 1- شاخص بودن معمار 2- طراحی معماری 3- فناوری روزآمد 4- موضوع و کاربری دوم- حوزه عوامل موثر در طراحی: 1- کارفرما -2 قانون گذار 3- استقبال عمومی 4- منظر فرهنگی سوم- حوزه تصمیم سازی و تصمیم گیری: 1- رویکرد بینارشته ای و عملکرد گروهی 2- مشارکت 3- انعطا فپذیری 4- تکمیل مجموعه معماری به وسیله دیگر طرح ها. اثری از معماری معاصر که واجد ارزش های فوق باشد، یک معماری «فاخر » نامیده می شود؛ و اگر بتواند به میراثی برای آینده تبدیل شود، یک «معماری سرآمد » است. به منظور ظرفیت های معماری معاصر ایران برای تبدیل به میراثی برای آینده، تعداد دویست اثر از آثار معماری معاصر ایران بر اساس نظر متخصصین انتخاب شده، مورد تجزیه و تحلیل قرار گرفته اند. دستاوردهای پژوهش نشان دهنده آن است که همانطور که در بسیاری از آثار معماری معاصر ایران می توانند به عنوان بخشی از معماری سرآمد و میراثی برای آینده مطرح شوند. Bandarin, F. (2003). Foreword, World Heritage Papers, No. 5: Identification and Documentation of Modern Heritage, UNESCO World Heritage Center. Mahdavinejad, M. (2014). Dilemma of Prosperity and Technology in Contemporary Architecture of Developing Countries, Naqshejahan, 4(2), 43-53. 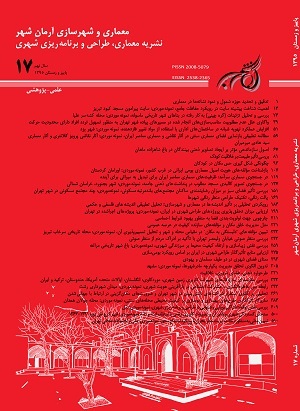 Mahdavinejad, M., Mansorpoor, M. & Hadiyan, M. (2014). Courtyard Phenomena in Contemporary Architecture of Iran, Journal of Studies on Iranian-Islamic City, 4(15), 35-45. Mahdavinejad, M., Mashayekhi, M. & Bahrami, M. (2015). Mosque Design Patterns in Contemporary Architecture, Journal of Research in Islamic Architecture, 2(5), 1-15. Mahdavinejad, M. & Jafari, F. (2014). Interaction and Contrast of Regionalism and Globalization in Contemporary Architecture; Case: Persian Gulf Countries, Journal of Research in Islamic Architecture. 1(1), 57-73. Mahdavinejad, M. (1996). The World Architectural Theories, Tehran: Jahad Institute, University of Tehran, Iran. Mahdavinejad, M. (1998). World Contemporary Architecture, Tehran: Faculty of Fine Art, University of Tehran Press, Iran. Mahdavinejad, M. (1999). New Horizons for Contemporary Architecture of Developing Countries, Tehran: Faculty of Fine Art, University of Tehran (Academic Pamphlet), Iran. Mahdavinejad, M. (2000). Contemporary Architecture and Legacy of Future, Tehran: Faculty of Fine Art, University of Tehran (Academic Pamphlet), Iran. Mahdavinejad, M. (2004). Wisdom of Islamic Architecture: Recognition of Iranian Islamic Architecture Principles, HONAR-HA-YE-ZIBA, (19), 57-66. Mahdavinejad, M. & Nagahani N. (2011). Expression of Motion Concept in Contemporary Architecture of Iran, Journal of Studies on Iranian-Islamic City, 1 (3), 21-34. Mahdavinejad, M. & Nagahani, N. (2012). The Impact of Visual Literacy on Perception of Beauty in Architectural Buildings, Armanshahr, 4(7), 51-62. Mahdavinejad, M., Hamzenejad M. & Kamyab M. (2012). Principles and Fundamentals of Design and Building of Mosalas in Contemporary Iranian Architecture, Journal of Studies on Iranian-Islamic City, 3 (9), 37-47. Mahdavinejad, M., Qasemporabadi M. & Mohammadlouishabestary, A. (2013). Typology of Qajar Mosque-Madarasa, Journal of Studies on Iranian-Islamic City, 3 (11), 5-16. Mahdavinejad, M., Bemanian M. & Khaksar N. (2011). Architecture and Identity- Explanation of the Meaning of Identity in Pre-Modern, Modern and Post- Modern Eras, Hoviateshahr, 4 (7), 113-122. Quito (1967). The Norms of Quito – ICOMOS, World Heritage Committee, United Nations Educational, Scientific and Cultural Organization. UNESCO (2003). Identification and Documentation of Modern Heritage, World Heritage Papers, No. 5, UNESCO World Heritage Center.